Today marks the launch of a Digital Inclusion Outcomes Framework. The Framework is intended as a single, flexible template for tracking digital inclusion in the UK, and evaluating activities locally. Anyone who chooses to use the Framework will be able to demonstrate how their digital inclusion activities contribute to local priorities and needs. This should help make the case for investment and partnerships, and drive improvement by identifying what works in delivering better outcomes. And, for the first time, we’ll be able to track the progress we are making as a society in achieving digital inclusion. Lauren Kahn is Head of Strategy in the Digital Inclusion team at GDS. She manages the cross-sector Research Working Group who’ve led the Framework's development. Here, she explains more about what it is, why it’s needed, and how to use it. Digital inclusion is increasingly important to enable all citizens to participate actively in society and to access digital services, products and networks. However, one in five adults in the UK remain offline or lack the basic digital skills needed to realise the benefits of being online. And, digital inequalities persist, following and reinforcing lines of social inequality. By investing in digital inclusion, we can support better economic, health and social outcomes for these groups and a more equitable society. But we know that engaging this ‘hard to reach’ final fifth of the population will require significant investment. In order to justify investment at a time when resources are scarce, and ensure it’s optimised, we need to know what works in delivering outcomes, and to track progress towards them. To date, this has been a huge challenge. Organisations across the UK are delivering a diverse range of digital inclusion activities that are responsive to local needs. However, this diversity often leads to inconsistency in how progress is evaluated, making it hard to compare and share learning meaningfully. Moreover, activities are often measured by volume, rather than value, so it’s difficult to tell what is working and measure the impact of these activities on people’s lives. Similarly, our ability to track progress in the UK is hampered by a lack of comparability across studies and over time. And, while existing indicators tell us how many people are making use of digital technologies, and how frequently, they don’t tell us how people are benefiting from them. The Digital Inclusion Outcomes Framework was designed specifically to address these challenges, by helping to evidence the wider economic, health and social benefits of digital inclusion. It provides a single, flexible framework that supports both ongoing tracking of progress at a national level and more consistent evaluation at a local level. The framework’s starting point is that getting people online and engaged in digital technology is a means to a broader end: that is, improved outcomes in many aspects of people’s lives. These outcomes are mapped out in the diagram above, grouped into three categories: intermediate digital outcomes, which in turn lead to wider economic, health and social outcomes. Progress towards each of the outcomes will be tracked by a set of multiple, relevant indicators, which are specific, measurable ways of assessing whether a change is happening, or whether an outcome is being achieved (see Annex 2 in this document for a summary of indicators). While there are many possible indicators for each outcome, we’ve identified a selection that correspond with sources of evidence that make clear links between outcomes and the use of digital technology, and which are reliable and collected regularly through national surveys. The framework provides a single, flexible template to support ongoing tracking of progress nationally and more consistent local evaluation. UK-wide studies and local projects will be able to measure and evaluate using the same broad menu of outcomes, picking and choosing selectively according to their unique priorities, and adding their own as relevant. The flexible, menu-based approach makes the Framework widely applicable and adaptable across diverse studies, initiatives, settings, target group needs and funder requirements - while at the same time supporting comparability and consistency in measurement across projects, and across studies and over time. The resources have been designed to save you time and money, and avoid projects having to ‘start from scratch’ when designing and carrying out evaluations. We’ll be blogging about new tools and resources as these are developed. Promote improvement by identifying what works in delivering better outcomes. In the long-run, use of comparable and impact-based metrics across projects will make it easier to share learning and best practice, and build towards a shared evidence base about what works. And, for the first time, we’ll be able to track comprehensively and robustly the progress we are making as a society in achieving digital inclusion. This will help target and tailor efforts, improve the use of existing resources and make the case for future investment, and increase our collective chance of success as we tackle the hard to reach 20% of the population who remain digitally excluded. These benefits can only be realised with your support! The toolkit is a prototype, and the GDS Digital Inclusion team and Research Working Group are now looking for help from a range of partners to help develop, test, refine, share and embed it. We want to make sure it works well for a wide range of users. Take a look, try it in your day-to-day work, see how it works for you and please share your learning and feedback. For more information on the Framework, how to use it, and how you can get involved, click here. 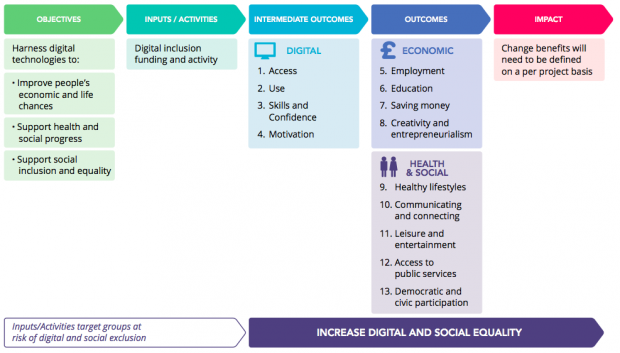 The Digital Inclusion Outcomes Framework has been developed by the Government Digital Service (GDS) Digital Inclusion Research Working Group, chaired initially by Professor Leela Damodaran, Loughborough University and currently by John Perkins, BT. The Research Working Group brings together representatives from academia, government, private sector organisations and charities.